The Movie Mezzanine Filmmaker Retrospective series takes on an entire body of work–be it director’s, screenwriter’s, or otherwise–and analyzes each portion of the filmography. By the final post of a retrospective, there will be a better understanding of the filmmaker in question, the central themes that connect his/her works, and what they each represent within the larger context of his/her career. This time, we’re going to examine the decades-spanning career of one of the most important filmmakers of this generation and generations prior: Terrence Malick. I always find it fascinating what dismissed, lukewarmly received films from the past end up being reappraised years later as masterpieces. From the Blade Runners to the Peeping Toms, it’s always intriguing to find how a change of general consensus on a film can not only comment on how underhandedly revolutionary a piece of art is, but also on how a culture changes and evolves over the years. 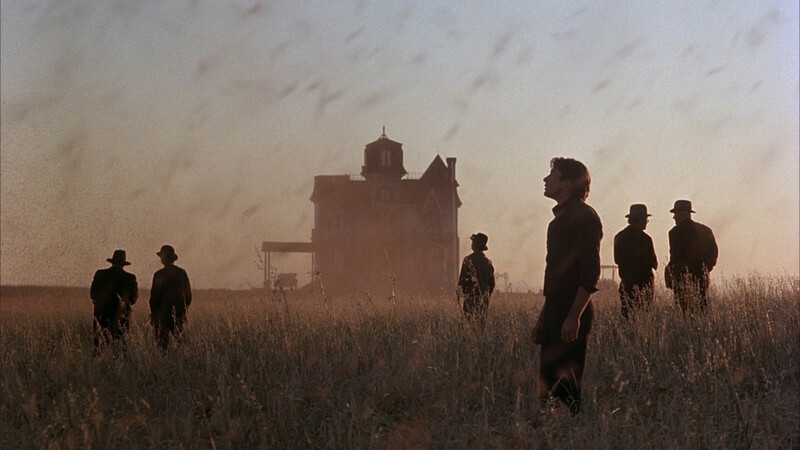 And you simply can’t take up a list of “rediscovered classics” without mentioning Terrence Malick’s follow-up to Badlands: the ethereal, gorgeous, and evocative Days of Heaven, a film that belongs in the pantheon of my Top 10 Favorite Films of All Time. When Badlands released, it was unanimously received as a masterpiece, but it was also a very clear “nascent debut”; something that only hinted at what Malick could accomplish if he approached his material with full force. And according to the mixed reactions to Days of Heaven‘s initial release, people simply weren’t ready for Malick’s “full potential”. Criticized for being “too distant”, “too muted”, “too focused on scenery and less on characters and story”, the film is now hailed as a masterpiece of cinematography, mood, imagery, and fluid, almost subconscious narrative. 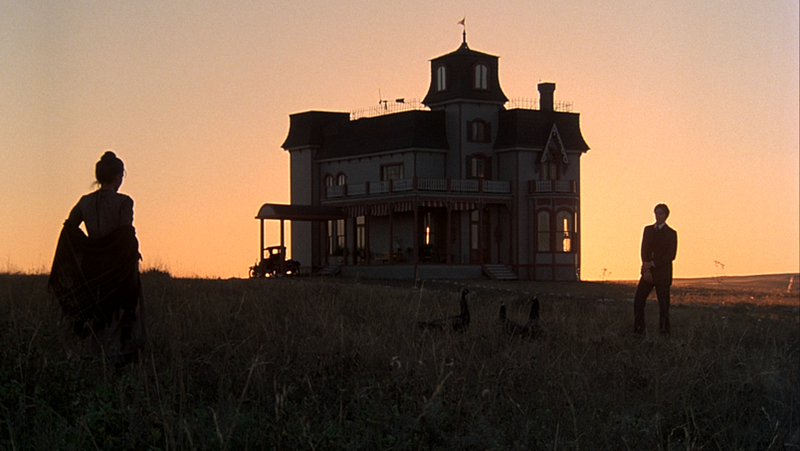 Without further ado, The Terrence Malick Retrospective continues with Days of Heaven. Warning: contains major spoilers. Days of Heaven opens not in the suburbs of the midwest nor the deepest recesses of nature. Instead, we begin at a steel mill circa 1916, where a worker named Bill accidentally kills a co-worker. As a result, he’s on the run from the authorities with his girlfriend Abby (Brooke Adams) and his younger sister Linda (Linda Manz), who gives the most evocative, natural, and beautiful voice-overs out of any Malick film (And if you know Malick, you know there’s a lot of voice-overs). Where they run off to is an unexpected paradise: A wheat farm in the middle of Texas where the work is rejuvenating, the pay is good, shelter is provided, and everyone is surrounded by the most gorgeous scenery as shot through Néstor Almendros’s lens. It is here that their days of heaven begin. From then on out, nothing could be more perfect than this ethereal wheat field and its freeing disconnect from the rest of society. That is, until Bill concocts a scheme to inherit the money of their rich, terminally ill boss (Sam Shepard, whose character is named only as “The Farmer”) by getting Abby to marry him. The days of heaven still continue from then on out, but those days are now numbered. There’s a strange, contradictory magic to Days of Heaven‘s effectiveness that makes it somewhat understandable as to why its reactions were so mixed during its initial release. It is true that the emotions are, in fact, purposefully muted and distant. This is done to not only avoid melodrama, but to further accentuate Malick’s theme of every working element in the universe being equal in scope and importance. A swarm of locusts is as monumental as the death of a loved one, you get the idea. Yet despite this “distance”, the film remains oddly overwhelming in its emotions, but in a different way. Certainly there was also a distance to Badlands, but it was easier to grasp in that film because it was meant to highlight the notion that our main characters were natural born killers and they were emotionally detached by the numerous lives they remorselessly ended. 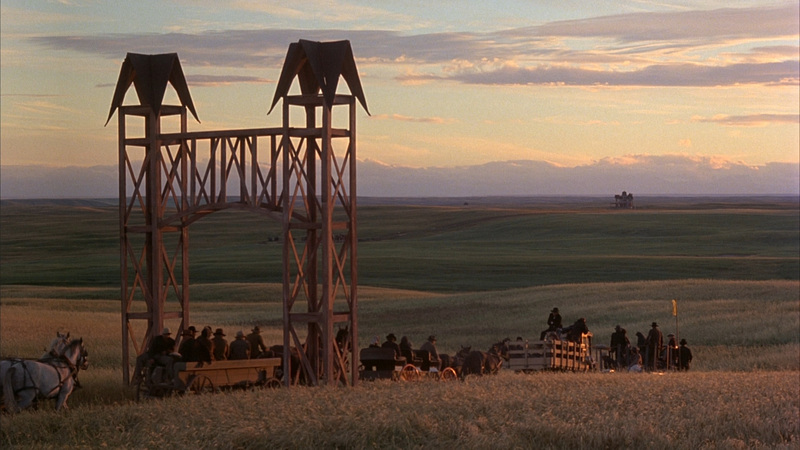 With Days of Heaven, it was a little harder to get a firm grip on. At first glance, the film had the story of a love-triangle melodrama (A plot-device ripe for soap-opera material), yet it wasn’t filmed at all as a melodrama. The film was less about focusing on the relationships of the characters, and more about how those relations worked in relation with the scenery surrounding them. The love-triangle wasn’t so much the device of a romance-plot as it was a countdown timer, clicking away the remaining moments before these days of heaven would inevitably end. Instead of an opera, audiences got an elegiac requiem. Malick had enough faith in the audience to catch that there would be an inevitable end, and as we’ve already established, only part of the audience understood what Malick was going for. Malick even provided one huge puzzle-piece to indicate that the love-triangle was, in fact, only secondary to something much larger: Linda Manz. Linda is undoubtedly the key to Days of Heaven. Not just because of her now famous, incomparable narration, but because of what that narration meant. Linda Manz was, in many ways, the true protagonist of the film. We were seeing everything, including the love-triangle, through her eyes and mindset. And as her naturalistic monologues suggest, she has more important things on her mind than what Bill, Abby, and the Farmer are dealing with. 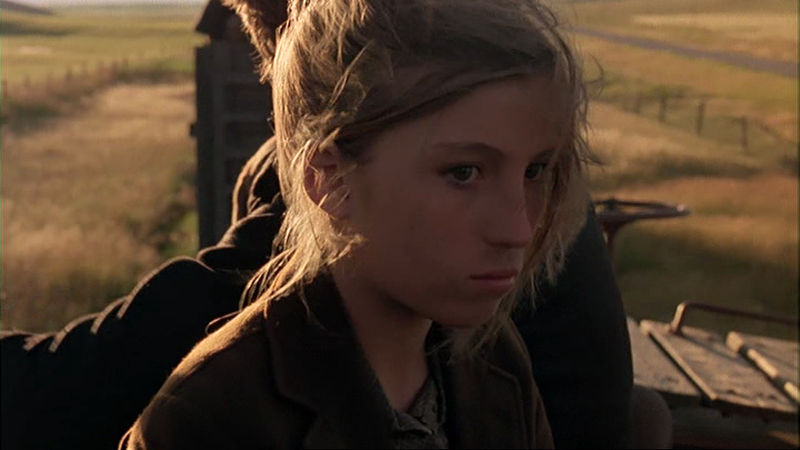 But while Linda Manz is certainly the key to penetrating Days of Heaven on an emotional and tonal level, the film is about so much more than her recollection of these events. As stated before in the Badlands piece, there are two main themes that always seem to connect Malick’s films. In Badlands, the emphasis was on man’s place in the universe, and our obsession with making a mark in it; attempting to prevent ourselves from dissipating into the void without either leaving behind something of meaning, or finding something of meaning within our minuscule existence. Days of Heaven undoubtedly uses this theme as we’ve already established, but there’s something else at play in the film. In the previous installment, I described the other one of Malick’s main themes as “the pain of transition”, but a better term to define it is “a longing for innocence”. On a surface level, that makes all of Malick’s films coming-of-age stories in a sense, but Malick aspires for more than just another portrayal of coming-of-age. Malick treats this coming-of-age not as a matter of growing up, but more as a creeping, unavoidable awareness of the darkness of the world. In every single Malick film, there’s a Garden of Eden, and in all of these films, the protagonists are banished from it at one point or another. Badlands was the closest Malick got to a traditional coming-of-age narrative, with its own Eden being the final vestiges of childhood innocence before giving way to adulthood. In Days of Heaven, the wheat fields are an almost direct representation of the Garden of Eden: A paradise where our characters are at their most innocent and happy; a paradise that’s ultimately not meant to last. 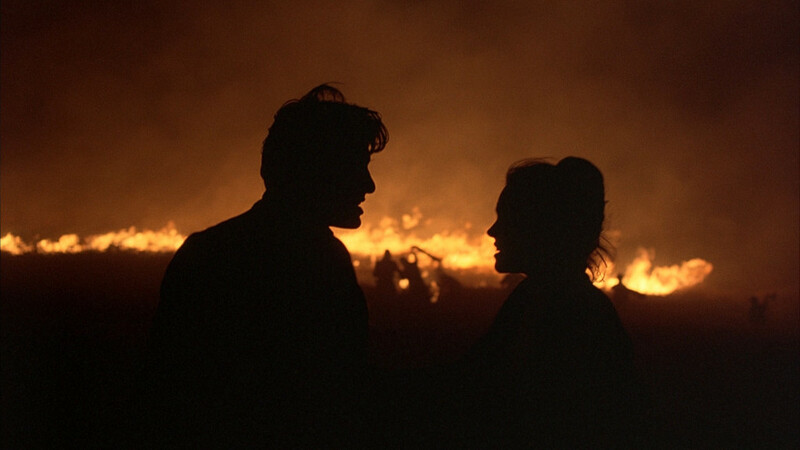 Malick has always had a spiritual streak in him, and Days of Heaven was the first indicator of that side of him. Using the imagery, the mood, and the voice-over, he transforms this simplistic story into a Biblical parable. Not only do the vast wheat fields feel like an Edenic Promised Land, but it’s eventual end is brought about by none other than a swarm of locusts and a hellish fire (as foreshadowed in the italicized quote above). The way these days of heaven come to a close, it feels less like the end of a end of an era and more like an apocalypse. And this Biblical apocalypse is brought about not by miracles or prophets, but by simple acts of human selfishness and wrongdoing. Bill and Abby attempted to have their fill of the forbidden fruit by exploiting and manipulating The Farmer, and now they are banished. That’s what makes Linda’s role as the narrator especially important. She’s our protagonist, yet she has almost nothing to do with the annihilation of the wheat fields. Bill and Abby are the real Adam and Eve of the story. Linda, meanwhile, is just a victim of their mistakes. In that sense, Linda is everyone that’s ever looked back at a situation of evil or despair and asked, “What went wrong?” And much like how it would be in real life, the answer is never simple. Bill and Abby were still motivated by an affection towards one another and a desire to live a rich, fulfilling life. And even when Abby is manipulating The Farmer, you can still feel a sense that she’s truly falling for him in some way. And The Farmer is portrayed here so sympathetically and heartrendingly by Sam Shepard. And even Richard Gere displays a level of pathos and kindness. And nobody’s the villain, and nobody’s to blame, and nobody is or was wrong in the eyes of Linda or God, Himself. And so it goes and so it goes. For we are all victims of “the original sin”. All that’s left in the end are the memories of those clouds rolling in. Of the wind making the wheat swish back and forth like a golden ocean. Of the flying circus and the rare instances of snowfall and the men waving their flags at either dusk or dawn. Of the days of heaven that had to end, like all days were made to. While reactions to Days of Heaven were mixed, the film still had its champions, and even won the Best Director award at the Cannes Film Festival (It was also nominated for the Palme d’Or, but lost to both The Tin Drum and Apocalypse Now, which were both worthy films of the title). You’d expect a director who still had a unanimously agreed-upon masterpiece and a more divisive but still fairly well-regarded art-film under his belt to make more movies after that. But that didn’t happen. What happened, you ask? Stay tuned next week, as we chronicle Terrence Malick’s mysterious disappearance, his triumphant return, and above all else, The Thin Red Line. For me, this is still Malick’s masterpiece as it would be the film that set a template of everything that is to expect from Malick. Minimalist plot settings, poetic voiceovers, lush cinematography, unconventional editing, and its use of classical music. I was so happy when the film came out on Criterion that I knew I had to get the Criterion DVD and get rid of a 2006-2007 DVD copy. It was worth it! Dude. You are a f**king GOOD writer.